In a medium bowl sift together flour, cocoa powder, and salt. 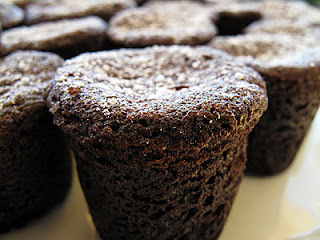 Transfer batter into a piping bag (or a ziplock bag with one corner cut off), fill each cup to the top. Bake 20 minutes or until set, but still a bit moist in the center (test with toothpick). Transfer pan to a wire rack; let cool for 15 minutes. Remove bouchons; let cool for another 30 minutes. Hubby Rating: 10, these are absolutely decadent. They are rich, chocolately, and rather simple to make. They are perfect for the holiday season. Enjoy!